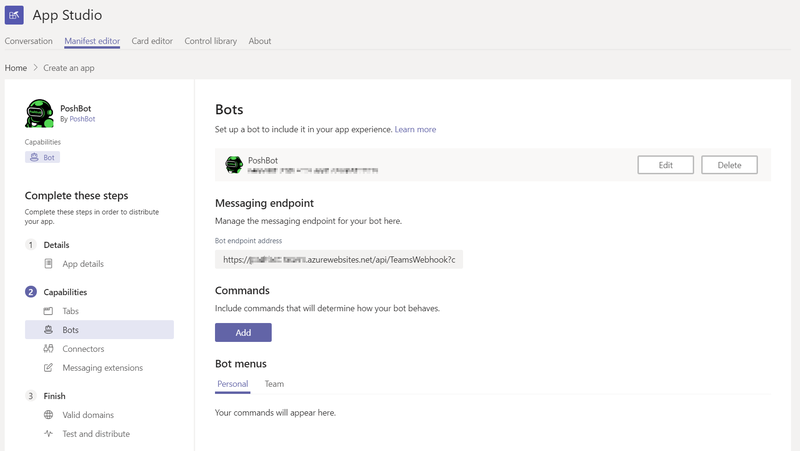 Because of the bot architecture in Microsoft Teams, there is a fair amount of work to enable PoshBot to work with it. When sending a message to a bot in Teams, it expects to be able to POST a JSON payload to a HTTPS endpoint. To avoid having to expose PoshBot on the internet while at the same time giving it access to your internal network for day-to-day ChatOps activities, an alternate method using an Azure Function and Service Bus is used. Teams will send messages to an Azure Function which will in turn send the message to a Service Bus queue. PoshBot can then make an outbound call to the queue to consume the messages. Bot command responses are then send directly to Teams. This allows PoshBot to be kept inside the firewall. 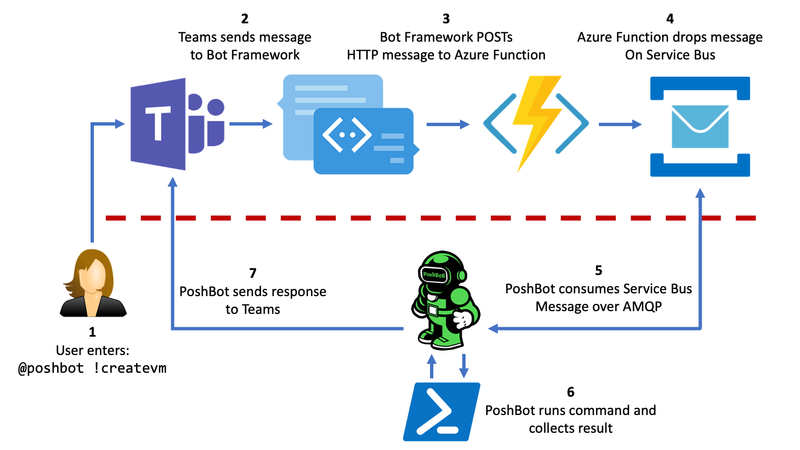 The steps to create the necessary Azure resources and wire up Teams to PoshBot is outlined below. Log in to your Azure subscription using the Azure CLI. Make sure you have the correct subscription active. az account set --subscription "<SUBSCRIPTION-NAME>"
Create a new resource group in your desired region. This group will contain both the Azure Function and Service Bus resources. Create a new Service Bus namespace in the resource group. The Basic SKU is fine for our purposes. Create a new Shared access policy called receive for the messages queue with Listen permission. Retrieve the SAS key for the messages queue. This key will be needed in the Teams backend configuration for PoshBot so it can connect to the queue and receive messages. Retrieve the root connection string for the namespace. This will be used by the Azure Function so it can drop messages into the queue when POSTs are received from Bot Framework. Create a new Azure Function in the resource group. This Azure Function will receive messages from the Bot Framework and drop the message onto the Service Bus queue. The source code for the Azure Function is contained in the TeamsWebhook GitHub repository. Since we're deploying a PowerShell-based Azure Function, we need to ensure we're using v1 Functions and not v2. This will no longer be needed once v2 PowerShell Functions are supported. Create an application setting for the Service Bus connection string. --name <FUNCTION-APP-NAME> --settings "SB_CONNECTION = $rootConnectionString"
Make note of the function URL. Unfortunately, the Azure CLI does not have a command to retrieve the function URL or token. To do that, log into the Azure portal and retrieve it there. Navigate to the URL below in order to create a new bot in Bot Framework. Note that the bot handle is globally unique and can not be changed later. Copy this value down as it will be needed by the Teams backend in PoshBot. For Messaging endpoint, enter the Azure Function URL you created earlier. Make sure the URL includes the function token so Bot Framework is making authenticated calls to your function. Make sure to create a new App ID and password and record these values. They will also be need by the Teams backend in PoshBot. Once the bot has been created, you'll need to add Teams as an available channel. Select Teams from the list of available channels and accept the Terms of Service. Once added, you should see both Microsoft Teams and Web Chat as connected channels. At this point you can test that Bot Framework, the Azure Function, and Service Bus queue are setup correctly by using the test pane in the Bot Framework portal. Verify that the message was then submitted to Service Bus queue by inspecting the number of items in the queue from the Azure Portal. You can also use the Service Bus Explorer to look at the messages. 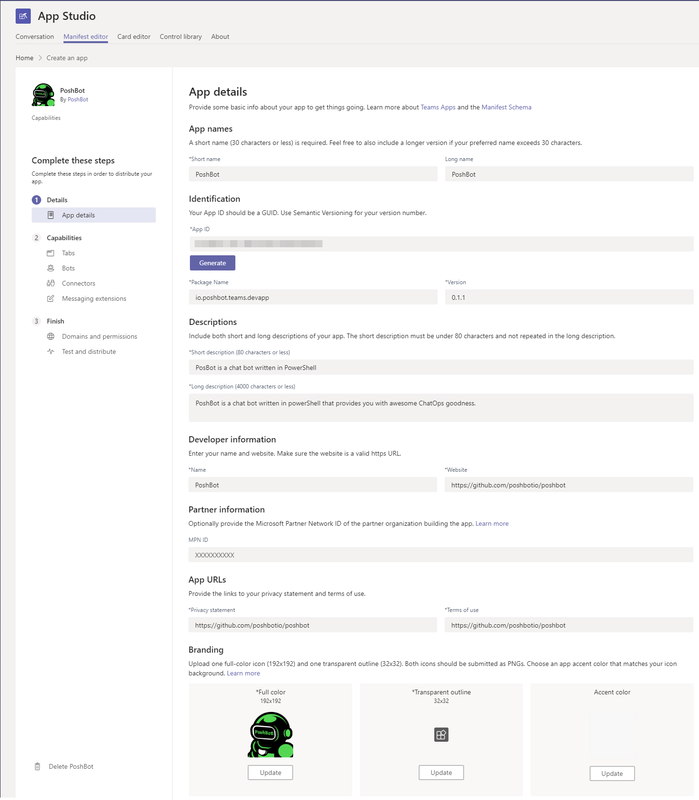 You'll need to create a new bot in Microsoft Teams and the easies way to do that is with the App Studio. Download and install the App Studio into Teams and follow the guide to creating the bot manifest. Navigate to Capabilities -> Bots and enter the App ID you created in Bot Framework. The messaging endpoint should update to reflect the URL to your Azure Function. Edit the bot settings and ensure Personal and Team are selected under Scope. Export the bot manifest to a .zip files on your computer. In Teams, go to Teams -> Manage Team. Go to the Apps tab and select Upload a custom app. Select the manifest .zip you just downloaded. PoshBot also needs to know your Teams ID so it can query it for the user roster. Without this, PoshBot cannot resolve User Principal Names to IDs and vice versa. 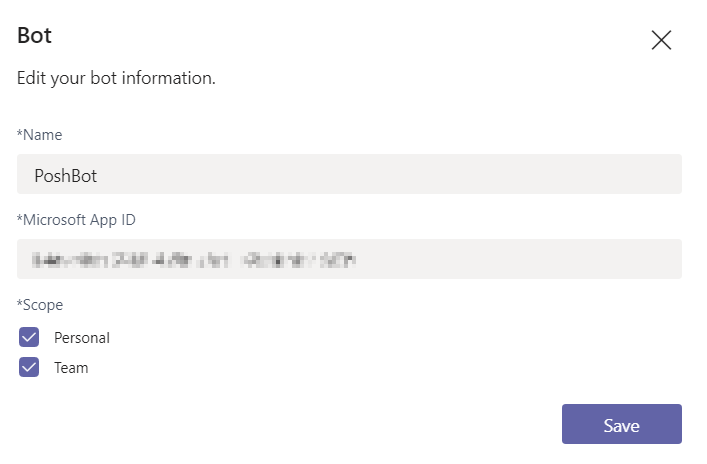 To get your Teams ID, go to Teams -> Get link to team, and copy the ID. It will have thread.skype at the end. This ID is URL encoded so run the following PowerShell command to decode it. The following example script shows how to create a new Teams backend using the values created above. Note that with the Teams backend, Azure Active Directory User Principle Names are used when defining the list of bot admins. Once the backend has been created, create a new instance of PoshBot and start it.